Classic 1960s day boat looks combine with the high-performance handling of a rigid inflatable boat (RIB) in the new Super 55 yacht tender from Ocean 398 and Dubois. 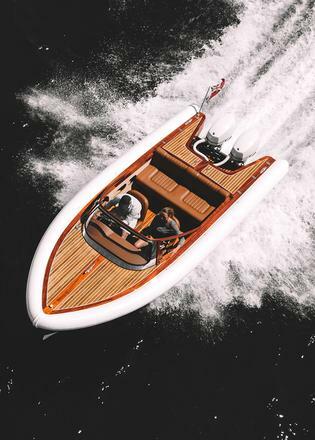 The 5.5 metre wooden RIB was the brainchild of Paul Mayes, director of superyacht tender builder Ocean 398 based in Hampshire, UK. 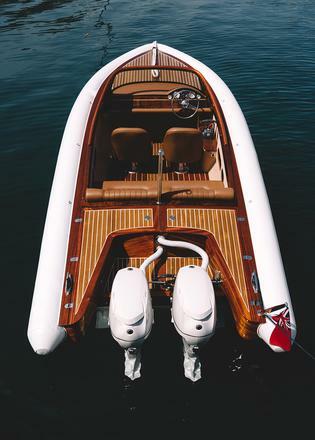 Mayes called upon the team at Dubois Naval Architects to help create a yacht tender with the elegant looks of a classic Italian Riviera wooden day boat but the speed and handling of a modern day RIB. “Mayes wanted to take his craftsmanship and skills and create a contemporary, performance RIB that turned heads wherever it appeared on the water,” according to Dubois. 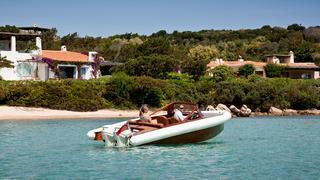 The Super 55 yacht tender can be customised to match her mothership. 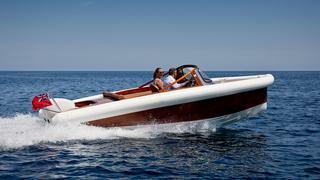 The hand built tender is constructed in wood – mahogany and teak – and epoxy composite. Hypalon inflatable tubes complement the wood with colour choices of Cream (pictured), Black, Cappuccino or Colonial available. The high-grade marine leather found inside can be had in tan, cream, red or black. 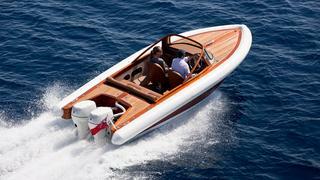 Paul Mayes was inspired by classic cars in the design of the Super 55 wooden RIB yacht tender. 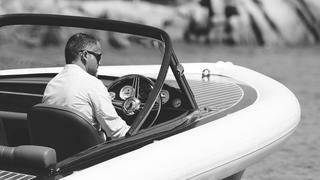 The wind screen, for instance, takes design cues from a Jaguar E-type. The five-seater Super 55 has hydraulic steering and is powered by twin 50hp Evinrude E-tec engines, with inboard/outboard configuartion available. She can carry up to twin 60hp or a single 115hp engine. Ocean 398 has also developed a new 6.6 metre Super 66, offering a larger and more powerful version of its classic inspired RIB.